A brief perspective of the historical development of covered bridges is provided in this chapter. Additional, in-depth information is available in many of the references. Perhaps the best indepth discussion of this topic is that authored by J. G. James. In 1982, he prepared a compendium entitled, "The Evolution of Wooden Bridge Trusses to 1850." His acknowledgements and apologies humbly explain that he prepared the material as an offshoot to his real love of iron trusses, for which he had prepared an earlier paper. 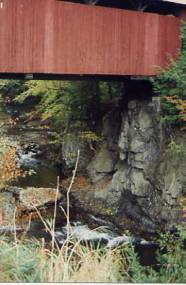 The material was reprinted more recently in the United States, in 1997 and 1998 issues of Covered Bridge Topics. Other sources provide even more distilled and generic summaries of the evolution of truss development, although it is very difficult to accurately portray such rapidly changing, complex events. Figure 20 shows one of the rare double-barrel covered bridges and one of the older in the United States (although the date of original construction is controversial.) The sidewalk on the left is a more recent addition. Figure 20. Rare, old double-barrel covered bridge-Pulp Mill Bridge, Middlebury, VT. The following historical context is intended to describe some of the challenges surmounted by those engineers and contractors who have built bridges that spanned distances longer than the longest available timbers. Andrea Palladio, a Venetian architect (1518-1580), is usually credited as the first to describe the form of structure we recognize as a truss, as presented in his Four Books of Architecture, more commonly referred to as his Treatise on Architecture, or simply Treatise, circa 1570. Yet some say that he was really only the first to publish information known to many at that time, including examples constructed (and possibly still extant) in Switzerland. In either event, little attention was paid to his writings until the middle of the 18th century, when European nations began building the bridges required for significant transportation systems. Although France had been the leader in early engineering, based primarily on their advances in stone and arch theory and construction, the Swiss and Germans were devoting more attention to using timber trusses in their bridges. Most timber bridges in Europe were not covered, although the oft-cited Schaffhausen Bridge over the Rhine River, constructed by the Grubenmann brothers in 1758, which included an awkward and inefficient timber roof, was an impressive two-span (52.1-m (171-ft) and 58.8-m (193-ft)) bridge. Many of the other early examples of covered bridges stemmed from efforts to provide roofed galleries, usually over simple pile and beam bridges, dating back many centuries. These early timber covered bridges were somewhat primitive; they consisted of piles driven into the riverbed, with timber beams spanning longitudinally between pile caps. The covers were more for the convenience of users who wanted to linger on the pleasant bridge setting. To span deeper rivers or gorges, the 18th century builders found piers to be costly, if not impractical, and they began looking for ways to span greater distances. They did not move directly to pure truss forms; they first used some versions of braced beams. Early German and Swiss truss bridges relied on kingpost and queenpost configurations with modifications to add arch action, via a strutted beam. Some of the German bridges included diagonal panel bracing in trusses with parallel top and bottom chords. The Swiss often relied more on ever-heavier timber framing, without many diagonal members. They preferred to build very deep beams, using mechanical connectors between stacked layers-an effort at laminating deep members from smaller members without relying on structural adhesives. Other developments in the evolution of timber truss bridges followed in several other European countries, but early bridge building in the United States really led to the most significant advancements in the theory of truss behavior. Americans who wanted to travel inland from coastal areas immediately faced the need to span streams of various sizes. Those sites conducive to pile driving were crossed with the classic multiple-span, timber stringer structures. Deeper water demanded longer spans. The gradual developments in Europe provided insufficient guidance to the American pioneers faced with a compelling need to build so many and such demanding structures as fast as they were needed. As might be expected, enterprising and ingenious American craftsmen, business people, and visionaries forged ahead, willing to test a myriad of structure styles to meet the demand for safe waterway crossings. Some of these structures were modeled after examples in Europe, while others clearly included ideas unique to the Americans. A notable advancement in timber bridge building was the crossing of the Connecticut River at Bellows Falls, VT. Colonel Enoch Hale used a two-span structure with total length of 111 m (365 ft). The supporting structure was a strutted beam; it took advantage of a natural and striking rock pier in the middle of a natural cascade. The bridge was immediately considered a major accomplishment, because it was the first to provide spans longer than possible with simple beams. Hale's bridge was not an isolated case. Many old bridges took advantage of natural features. Figure 21 shows a stone abutment that should last long after the bridge. Figure 21. Classic use of a natural formation as an abutment-Red Bridge, Morristown, VT.
Another American bridge pioneer was Timothy Palmer. He was an extraordinarily energetic, talented, and prolific bridge builder who experimented with progressively flatter structures that relied less on arch action. The bridges built by Palmer through his career consistently used more panel braced timber frames in configurations that can be identified as trusses. After constructing several large bridges, Palmer sought and gained approval to span the Schuylkill River at Philadelphia, PA. His resulting structure was substantially different from earlier bridges built at the same spot, and included three spans (two of 45.8 m (150 ft)), and one of (59.4 m (195 ft)) without struts from below. The trusses were built of heavy timber members with bracing, and the bridge was completed in 1805 or 1806, depending on the source. The bridge was expensive and critical to ongoing commerce, so it was enclosed with sides and a roof to protect it from weathering, leading to its name the Permanent Bridge. Although there are hints of even earlier covered bridges in the United States, this bridge is most often cited as the first. The United States established its first patent office in 1790. Tragically, for the purposes of historical research, a fire destroyed this office in 1836 with the loss of all patent records to that date. Efforts were made to restore as many of the patents as possible, yet many remain lost forever. Hence, any definitive statements of fact regarding the earliest patents related to the developments of timber trusses and covered bridges are suspect. Not surprisingly, some historians have made heroic efforts to compile as many of the lost pieces as possible. Richard Sanders Allen deserves special recognition for his compendium of "Thirty-Two Lost Bridge Patents." As his title suggests, even just the recovered patent variations alone are too numerous to fully describe in this manual. In an ongoing effort to focus on the surviving authentic examples of North American covered bridges, the following discussion includes only the more prominent developments. Early North American bridge builders actively pursued patents for their designs in an attempt to gain more bridge construction contracts. A few of the very first patents involved general bridge construction, but by 1797, there were several that involved specific schemes for timber arches. Among others, Timothy Palmer received a patent that year, the details of which remain unknown, but he began construction of his Permanent Bridge only a few years after this, his initial patent. Theodore Burr obtained the first of his many patents in 1804 or 1806, (again, according to the source), which regrettably remains among the unrecovered records. His second patent was issued in 1817. Burr's trademark design dates from this patent. He extended curved lower ribs that had reached only bottom chords, up along the trusses, all the way to the top chord. This superposition of arch and truss forms seems to have been influenced by earlier bridges built in Switzerland. The resulting structure has been described as a combination of conventional trusses (parallel chords with compression diagonals) and supplemental arches. One of Burr's early examples of this bridge form, and probably the basis for his 1817 patent, was his Union Bridge crossing of the Hudson River between Lansingburgh and Waterford, NY, circa 1804. This was a significant structure; 244 m (800 ft) long, with four spans. The structure was rebuilt after being in service for some time, to include a roof and siding. This heavily braced and counterbraced structure exemplified what today is called a Burr arch. Lewis Wernwag was born in Germany in 1769 and obtained a patent (which is also lost) in 1812. The patent most likely described a structure similar to his crossing of the Schuylkill River at Philadelphia, PA's Upper Ferry. The huge 104-m (340-ft) trussed arch span was quickly termed the "Colossus" and represented a major triumph in bridge construction, with its attractive and apparently efficient use of timber, supplemented with iron rod bracing members. Wernwag owned a metal works company and relied more on early forms of metal connections and components rather than on traditional timber joinery only. He received a second patent in 1829 for improvements in his structure. Regrettably, the bridge was lost to fire in 1838. Ithiel Town (1784--1844) of New Haven, CT, was a prominent architect known for designing many types of buildings. He also planned many bridges, initially experimenting with various truss arch combinations. However, Town wanted to devise a structure that would require fewer carpentry skills than was required by the intricate joinery details of some of the early bridges. Using only planks joined with round wooden pegs, he began developing a lattice style of truss construction and obtained his first patent in 1820. He was nearly as good a promoter as an inventor, and the lattice truss became very popular, although it has been criticized for its apparent waste of material. This truss layout proved to be very adaptable. It could include heavier members for longer spans, and could even be doubled up to include two layers of web members and three layers of chords for heavy loads, such as those generated by the railroads. A few of his bridges were built with such heavy members that they became identified as a timber lattice, as compared with the more common plank lattice. 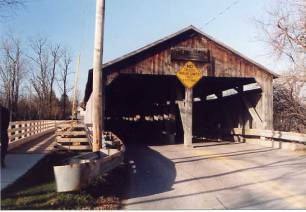 The most famous of the surviving timber lattices is found in the Windsor, VT-Cornish, NH, covered bridge over the Connecticut River, which remains one of the longest two-span covered bridges in the United States. Stephen Long (1784--1864) had a varied background and career. He gained his experience as a timber bridge builder while serving in the U.S. Army. Long was commissioned to locate, plan, and build the Baltimore and Ohio Railroad. He chose to use a standardized truss for all his spans, with timber counterbraces in all the panels. With the addition of timber wedges at the bearing joints between the posts and diagonals, he found that he had better control over the trusses' as-built geometry. He obtained his first bridge patent in 1830. Subsequent printed materials pronounced that these wedges allowed the truss builders to induce member forces in the trusses that effectively prestressed the structure, to employ today's terminology. William Howe (1803--1852) made a major contribution to the evolution of timber covered bridges by being the first to use metal components as primary members within an otherwise timber truss. He used parallel timber chords, with timber diagonals and counters in the panels, but he used round iron rods for the vertical tension members. The threaded rod ends allowed easy adjustment of the structure, to keep it tight both during and after erection. Many modifications were made over the years to Howe's original design to address various desired details, but his truss was quickly adopted to withstand the heavy loads on railroads. The popularity of the Howe truss continues today. It is often selected when constructing new covered bridges. Howe's modification was a major reason for the short life and reduced popularity of Stephen Long's truss-which was essentially the same, but without the iron rod verticals. His 1978 book, Last of the Covered Bridge Builders, is a fascinating collection of stories and information from his many years spent rehabilitating existing covered bridges and constructing new examples. There are many examples of authentic, but new, covered bridges built in the last few decades of the 20th century. Interestingly, of the 30 States that currently have covered bridges, more than half have built a new covered bridge within the past 30 years; some have built several. Although some owners, engineers, contractors, and even bridge users have distinct preferences for specific truss types, these newer bridges have used nine different truss types. Figure 22. 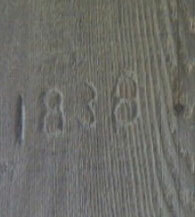 Date carved in an end post of the Westford Bridge, Westford, VT—may be original to the bridge.